It appears I didn't mention here the Windytv.com website with awesome presentations of wind, temperature, waves, precipitation and pressure forecasts. Dragons that once appeared on maps of the Arctic apparently now only live in the Southern Ocean near Australia. It's even more beautiful than we imagined. A type of seadragon known only from museum specimens has been seen in the wild for the first time in deep water off Western Australia. Two ruby seadragons were observed for nearly 30 minutes, uncovering new details about their anatomy, habitat, and behaviour. The researchers from the University of Western Australia, the Western Australian Museum, and Scripps Institution of Oceanography used a mini-remotely operated vehicle in waters more than 50 meters deep near the Recherche Archipelago off Esperance. Alright, I'm not really convinced early map makers were referencing the same or similar species to these small creatures now known to science. epiphyte: definitely unprecedented in recorded history. The map shows what was considered to be an average minimum, i.e. summer ice extent in 1939. I notice pack ice reaches to almost 85' N of Svalbard . Permanent sea ice appears to cover less area than in my old school Atlas from 1975..
Eleven nations established 14 principal research stations across the Polar Regions. 12 were in the Arctic, along with at least 13 auxilary stations. Over 700 men incurred the dangers of Arctic service to establish and relieve these stations between 1881 and 1884. The Norwegian Svalbard archipelago was known as Spitzbergen before 1925 and includes the island of Spitzbergen. The Russian military's Franz Josef Land archipelago is also know as Franz Joseph Land and (less often) Franz Josef(ph) Islands. A cool map of FJL from an 1894-97 expedition is too big to show as an image. An FJL sketch map is depicted below. you can send me the image so i can gonna make it smaller for you if you like, assuming that you're talking about file size not image extent :-) however that as well could be fixed/altered, just in case you're interested. Thanks, magnamentis. From above, here is the "cool map of FJL from an 1894-97 expedition is too big to show as an image." Click for enlarged, and much better looking, version. There is a mix of ice shelfs here: Only the first picture shows the Shackelton Ice Shelf, the others show the West Ice Shelf where a large ice berg is finally breaking apart after staying put for at least 25 years. All of the above images show the Shackleton ice shelf. The West ice shelf lies between Amery and Shackleton and is not shown above. Please see the image below. The ice island in Shackleton is sometimes known as Pobeda ice island: it is mentioned in my article The Amery Zig-Zags. 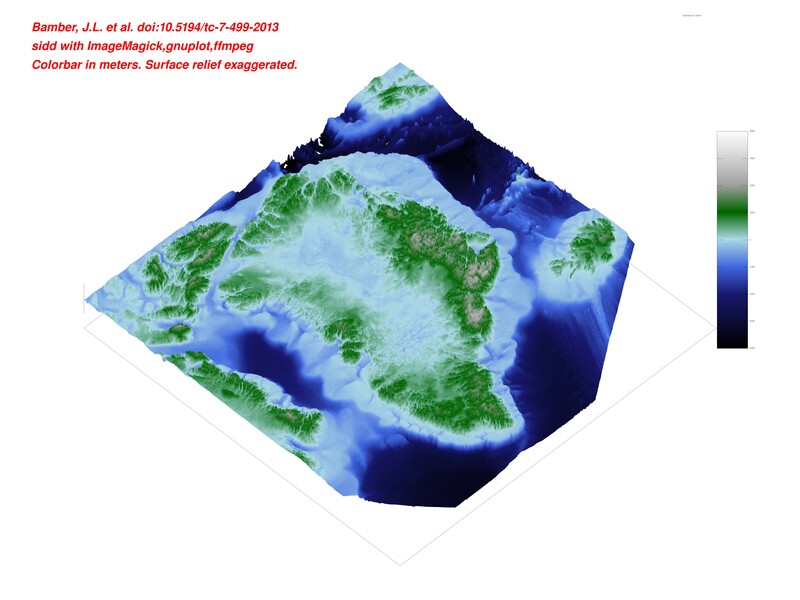 Crosspost plus Greenland map image (rotated - 'up' is to the right). Click on links for 2 versions of map with scale. You could try contacting the Royal Geographical Society in London( RGS.org ). they've got heaven knows what in their archives. Nordaustlandet (northeast land) the second largest of Svalbard’s islands. Credit to reddit the front page for upvoting this. Has the limestone gone dolomitic? Memories of breaking my hands and heart breaking up some of it in the Forest of Dean, England. ps: These old maps are wonderful, made by true Mariner Masters. A much better map than what I created June 15, 2015 (above)! I like to say 'ice-free for all practical purposes', after hearing Walt Meier putting it like that once. Here's a map showing what 1.0 million, 0.5 million, and 0.1 million km2 of ice extent could look like. It's based on the grid cells with the maximum concentration in NSIDC September maps for the years 2008-2016. My assumption is that ice will last longest in grid cells where Sept concentration is consistently the highest over the past decade. If someone knows of a better version of this analysis here or elsewhere, please let me know! Looking at the map, I'd say that 1 million km2 is actually a bit high for an "ice-free" threshold, personally. looks like a definitive interactive map of officially named undersea features. Real maps! Cross post from What's new in Greenland? thread. I particularly value the map on the right that shows where glaciers have 'deep water ports' and are therefore most likely to suffer from warm ocean water melting their undersides. The Petermann Glacier's fjord's depth was (more or less) known to me. Of interest is Jakobshavn Glacier's deep connection to the interior. Then there is the 3rd 'direct access' to the interior via Kane Basin and Humboldt Glacier. 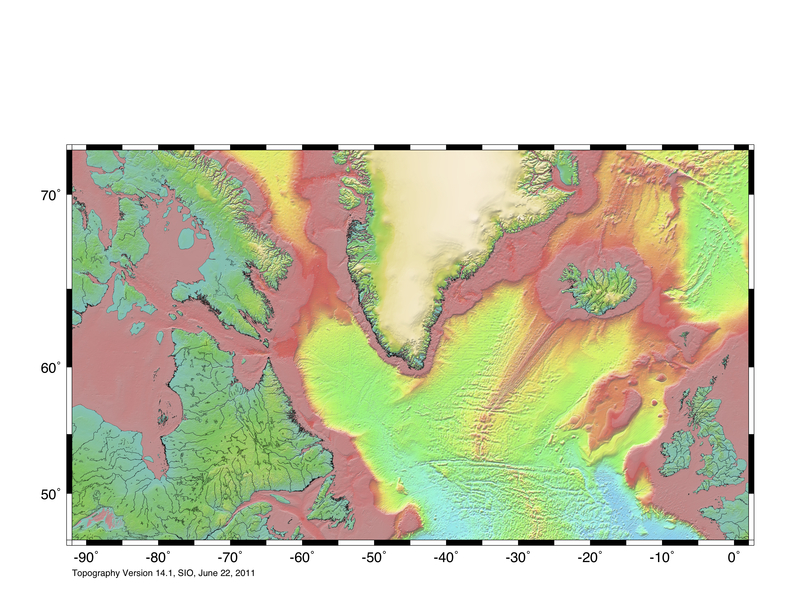 The Boundaries of the Arctic Ocean Seas. 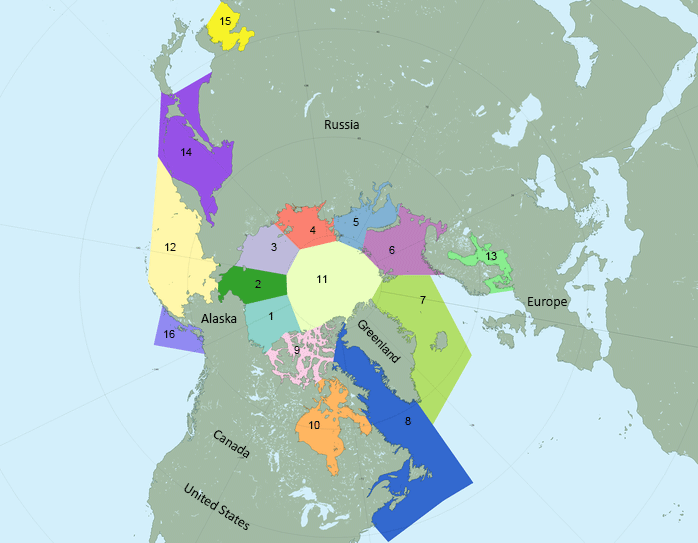 I looked for a definitive map of the Arctic Ocean with the boundaries marked in three ways - those used by the NSIDC for their regional extent and area spreadsheets, and the political boundaries. I think this is the NSIDC regions map. Much more, including pictures and video, at the link. Thank you Anne. The article was fascinating. And maps are maps, so it wasn't 'off topic'! I agree - maps is maps and always useful. So here are three more that I found useful when considering topics such as snow cover, effects of June river flows etc etc. Lots of stuff on the melting season thread on the Canadian Archipelago. Here is a political map with at least some of the names on. DeLorme(now owned by Garmin) highway maps are "books" of maps of the states of the U.S. 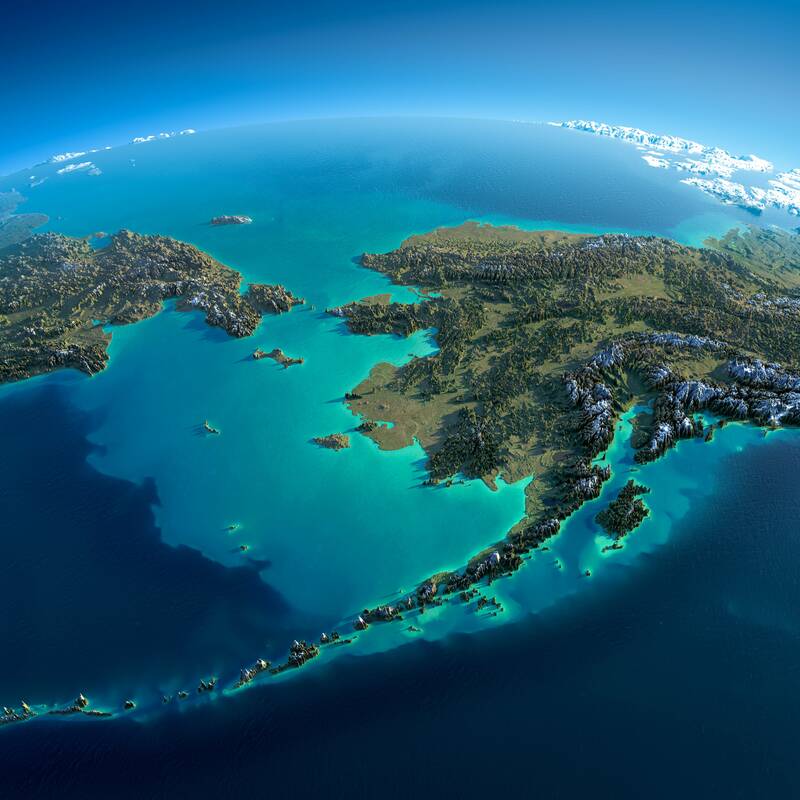 The representation of Alaska is a 156 page real book, with the highest detailed sector maps giving a stunning lifetime study of Alaska. 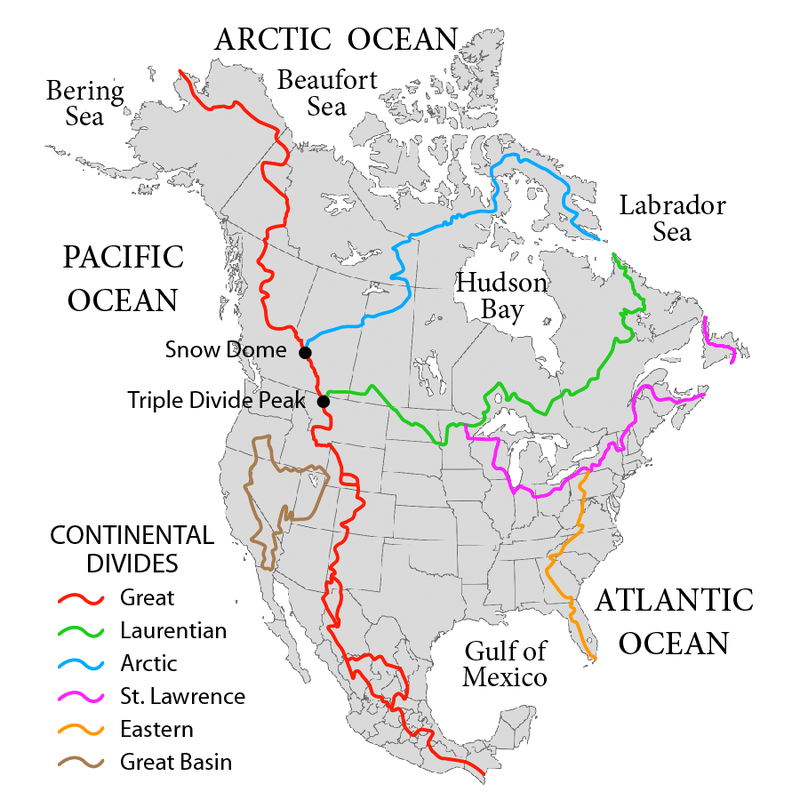 Unfortunately for this website's followers, northern & western representation maps (including Alaskan lands bordering the Bering Sea, above the Arctic Circle line & Aleution Islands) are at a lower presentation of detail (still good,tho) & no sea ice conditions are included. 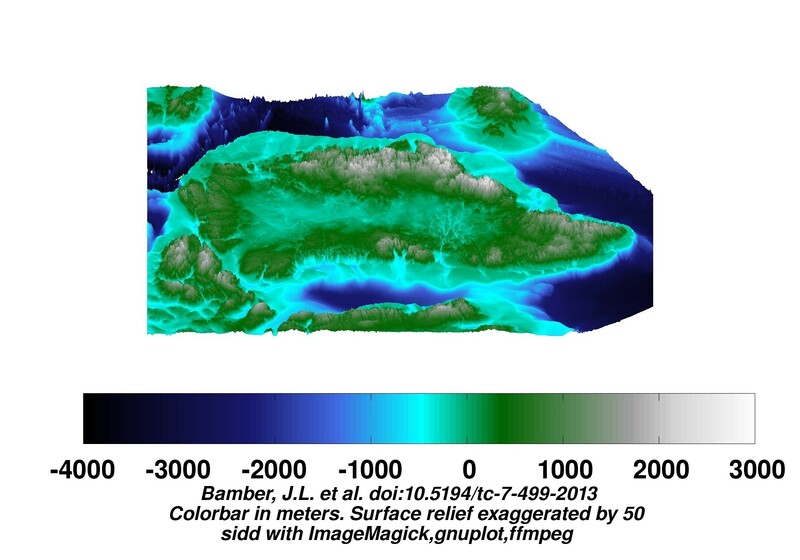 However, the high detailed south & eastern sector maps, including shorelines & interior, do have glacier extents (hopefully accurate). I have a 1998 version (gotten at garage sale) that I love. An up-dated Delorme Alaskan map is available, & would give interesting physical terrain detail differences to the original, if such be the case. Ironbark Zinc took advantage of the poor ice conditions north of Greenland and chartered the ice breaking bulk carrier Nunavik for a tour to Citronen fjord as a proof of concept for their mine in the fjord. weather.us has direct day-to-day comparisons now for very many variables! Unfortunately the data only goes back to 2017, but here is the year over year for snow depth. You can toggle back and forth for many other variables as well (SWE, water temp, sea ice, pretty much anything). The ^ data is from the EURO. On that note, it is interesting that EURO is the only model where water temps and sea ice appear to be un-static, perhaps explaining one of the reasons why it is so much more accurate than the GFS / CMC, both of which lack these options for toggling (and whose consistently terrible output leads me to believe they do not incorporate it beyond 00z hr data as well). 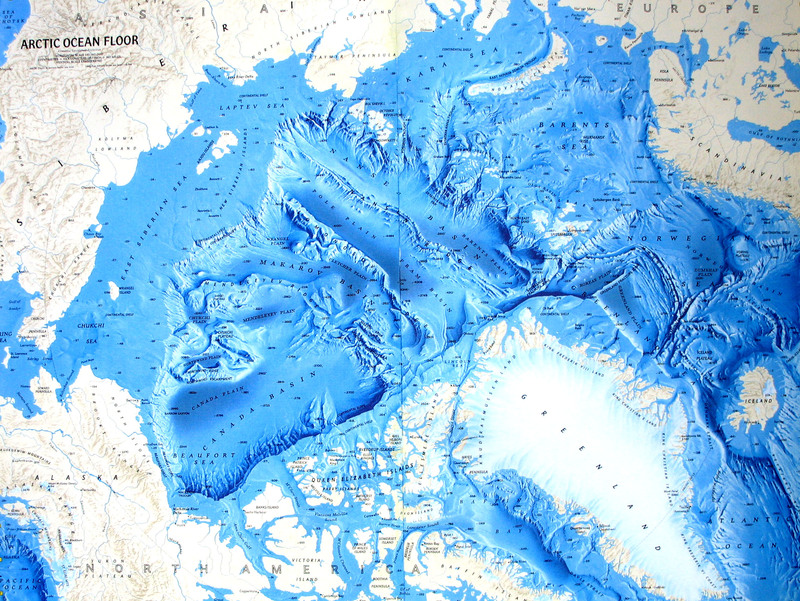 A map - of the position of the main Greenland glacier fronts. I can never remember them all (easily confused at my age). Also posted on "What's new in Greenland"
Not sure where this should go - but worth noting - looks like the Magnetic North Pole is sliding away from Canada / USA towards Russia. "OSLO (Reuters) - Rapid shifts in the Earth’s north magnetic pole are forcing researchers to make an unprecedented early update to a model that helps navigation by ships, planes and submarines in the Arctic, scientists said. Compass needles point towards the north magnetic pole, a point which has crept unpredictably from the coast of northern Canada a century ago to the middle of the Arctic Ocean, moving towards Russia....... "
Update planned for 30th Jan is dependant on US gvt shutdown !!! Where will all the snowmelt go?